The Broncos and Chiefs have the megastar defensive backs and pass rushers. The Texans are a well-coached veteran unit built on disguised matchup coverages and blitzes. The Patriots simply don’t miss tackles or assignments. 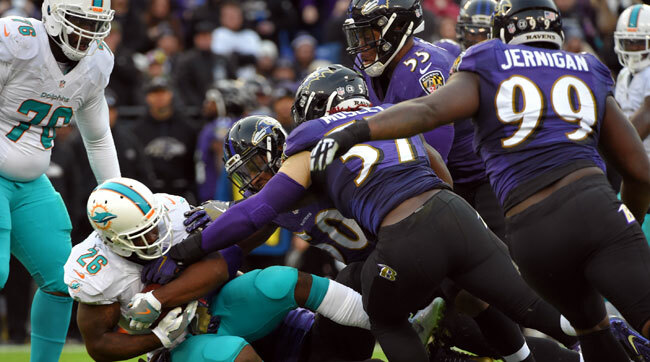 The Ravens D tackles Damien Williams at M&T Bank Stadium. Remember the Williams Wall in Minnesota? Pat Williams as the gap-clogging nose shade tackle; Kevin Williams as the gap-shooting three-technique? These Ravens are often thought of as a 3-4 defense, but they actually play the same gap principles as those 4-3 Vikings. And they’re doing it with the closest thing we’ve seen to a Williams Wall replica in Brandon Williams and Michael Pierce. Brandon Williams (l.) and Michael Pierce. For his first three seasons, Brandon Williams, a third-round pick from Missouri Southern, was the best NFL nose shade tackle who nobody talked about. Now in his fourth season, he’s found himself shedding blocks and penetrating a little more often out of a three-technique spot (that is, when it’s not being filled by the steadily improving Timmy Jernigan). That’s because undrafted rookie Michael Pierce has unexpectedly earned meaningful snaps at the nose position. You almost never see rookies—especially undrafted ones from an FCS school such as Samford—thrive in the middle of the NFL’s trenches. The difference in talent between college and professional players is more pronounced at interior offensive line than anywhere else on the field, making a defensive lineman’s learning curve that much steeper. And Pierce, who figures he went undrafted in large part because he’s only 6’0”, says it was startling to learn “how much more intelligent everyone is, football-wise [in the pros]. You can study film, but as far as knowing the nuances of the position, you don’t really get that as much coming from [the FCS division].” Every coach will tell you that aside from quarterbacks, centers—the men with whom Pierce spars—are the smartest, craftiest players on the field. It's a two-way street between ’backers and D-linemen. No defender in the NFL consistently penetrates after being doubled more than Williams. The fact that it often comes on first and second downs (and within context of the scheme) makes it all the more impressive. On Monday, the Ravens travel to Foxboro to face one of the few offenses they don’t match up particularly well against. Against front sevens such as Baltimore’s, the Patriots are willing to eschew the run and throw 60 times, mostly from spread sets. When they do, their receiver alignments and shallow route combinations put tremendous stress on safeties and linebackers. Orr and especially Mosley have played with outstanding awareness in underneath coverage this season. That’ll be the deciding factor come Monday night. 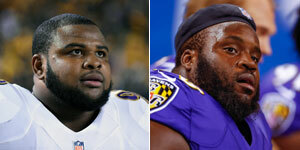 But even with a loss, the Ravens would still control their own destiny in the AFC North. Theirs isn’t a defense that you can beat one-dimensionally through the air. Its pass rush is improving (Elvis Dumervil is back healthy) and so is the secondary in its foundational zone coverages (Lardarius Webb is getting more comfortable at safety, and so is fourth-round rookie Tavon Young at left corner). Someone will have to run on these guys. Despite a good statistical performance by Dallas (118 yards) in Week 11, no offense has really done other than the Jets (155) in Week 7 and Browns (145) in Week 2.